It’s your boy Chief Sumo aka Rabbi Can’t Lose aka Noah Kagan. I’ve hacked into the AppSumo mainframe to share some big updates we’ve made for you at Sumo.com. What up, Sumolings!It’s your boy Chief Sumo aka Rabbi Can’t Lose aka Noah Kagan.I’ve hacked into the AppSumo mainframe to share some big updates we’ve made for you at Sumo.com. 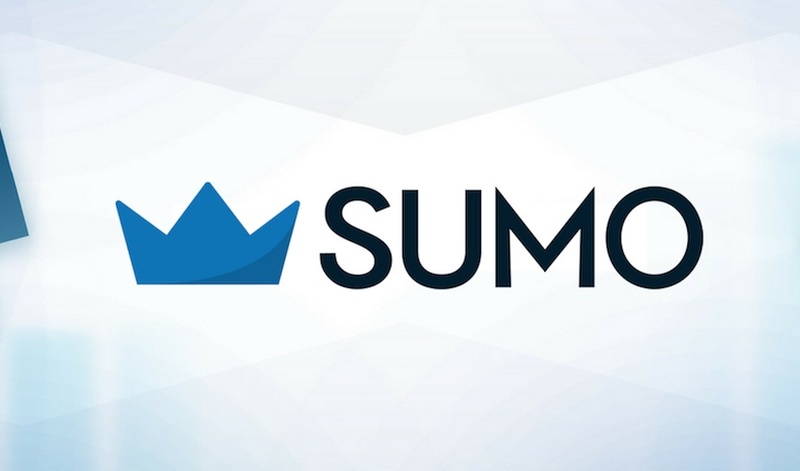 Sumo has all the tools we’ve used to grow AppSumo to an 8-figure business, with nearly 1 million Sumoling subscribers. (Hi, Momma Sumo). It’s been over a year since we last chatted and a lot has changed here in Sumoland. BRAND NEW Live Chat: Talk with your website visitors, prospects, and customers in real-time. Revamped List Builder: Grow your list on autopilot with pop-ups, welcome mats, and scroll boxes. Don’t want to annoy your visitors? No problem, you can completely control the display rules, design, copy, and more. 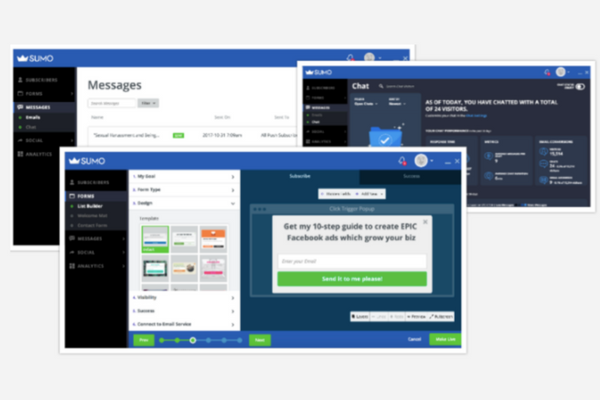 Our tools have helped companies like AppSumo, Bulletproof, and Marie Forleo grow their email lists, get more customers, and build more profitable businesses. 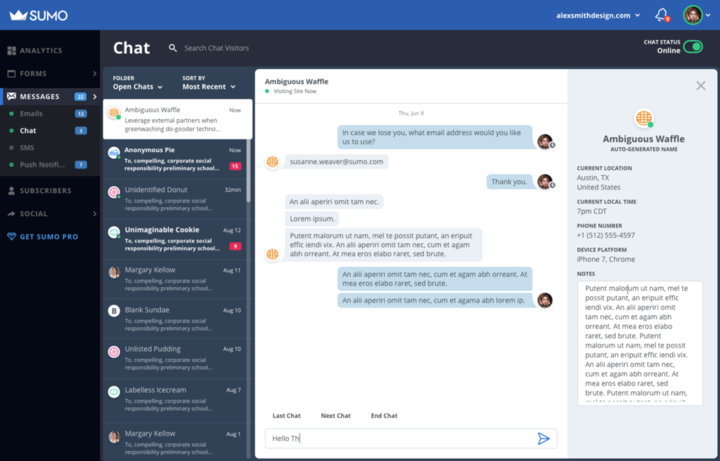 We’re giving you first access to the brand new Sumo, including Live Chat, Message Center, and a revamped List Builder (plus a ton more tools) — so you get the entire suite. That means more money for you to go learn the dance moves to Despacito. Professional: Perfect for bloggers, contractors, and consultants. Includes unlimited email subscribers, hyper-specific targeting, and pre-built templates to get you up-and-running. Small Business: Made for small teams. Includes everything in the Professional plan — plus our new Live Chat so you can talk to visitors on your site in real-time, pro analytics to track performance, and content upgrades to 5x your conversions. eCommerce: Ideal for eCommerce sites and SaaS companies. Includes everything in the Professional and Small Business plans along with discount codes for your customers, direct Shopify integration, and white labeling. $50 in AppSumo credits to spend on anything you want! Upgrade to a paid plan today and grab your credits! At Sumo, the most important thing for us is that you grow your business. With Sumo, if your email list goes from 0 to 1 million subscribers, you get charged the same amount. You double your business next year? That’s right, same amount. Sumo can help you grow — for a fraction of the cost. But don’t take just my word for it. 100,000+ sites use Sumo every day — including Airbnb, Book Like a Boss, and Bulletproof — to collect over 10 million emails and grow their website and business. You know what to do. Go sign up for a free or paid plan today. P.S. You ONLY get the $50 AppSumo bonus when you join a paid account in the next 24 hours. P.S.S I’m doing a LIVE AMA in our AppSumo Fans FB Group for y’all today at 12pm EST(9am PST). Let me know what questions about growing your business, marketing, AppSumo, Sumo, etc. y’all have.